I have been a birth teacher since around 2005 and I have to say, it is one of the BEST jobs ever. I love it. I get to be with my kids during the day, I get to talk to other people about something I love and care about, and they actually WANT to listen. It doesn't get much better than that. Recently I switched gears and stopped teaching the Bradley Method and started teaching Birth Boot Camp. I am also on the board of directors for Birth Boot Camp and I participate in training the new incoming teachers. Since I am involved I am frequently getting e-mails from people interested in becoming birth teachers but who have some questions. This post will address some of those questions. Because of my obvious involvement with Birth Boot Camp it will be directed specifically to the ins and outs of teacher certification with that method. 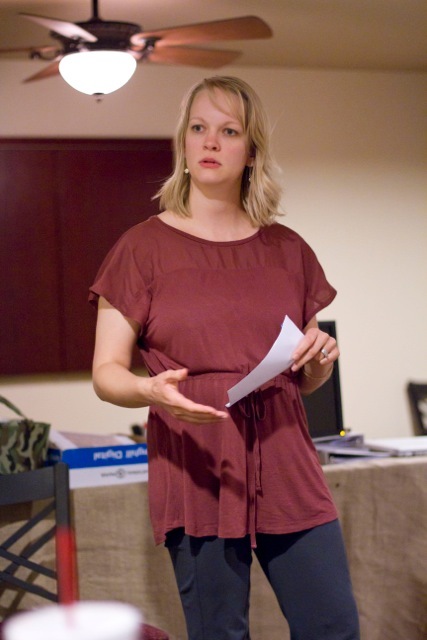 The basic starting points to becoming a Birth Boot Camp instructor can be found HERE on the website. The following are some questions I have heard frequently. If you have any more questions, please feel free to ask. This is the contact page and we will be happy to answer your questions. The Birth Boot Camp founder, Donna Ryan, running a teacher training. Q: I want to do a training right away, which one should I sign up for? A: If you have looked at the become an instructor info you can see that there is a lot of work to be done, including thousands of pages of reading. Many methods do have teachers come to trainings and then finish up lots of stuff AFTER the training. This is not how Birth Boot Camp is designed. We want the teachers to do their studying before hand so that they are 100% ready to go once their training is over. A lot of your work goes in early. We will probably get fewer people signing up because they have so much to do BEFORE the training, but that is OK, we want dedicated teachers who are ready to teach. When I first trained to be a teacher years ago it took about a year to be fully certified AFTER my training. That is not how we are working things. The last training I taught, we had teachers whose classes were starting in the next few weeks. You can literally hit the ground running after your training and be ready to teach. Again, this is why if you are really interested you should contact us and turn in the application. The next two trainings are very close to being full and we CAP the number of people who can attend. You can't count on being included if we don't know you are coming! Taking the test at the end of training. Q: Why do the trainings get more expensive?! A: We are just starting out so the first few are a little cheaper! That makes sense, doesn't it?! I paid over 1000 for my first training so I think the cost we have is incredibly reasonable. You also get INCLUDED in your training costs your teacher manual, some materials and all your birth videos for your classes. This is BIG- many teachers pay a lot for birth videos and yours are included and you don't have to hunt for videos. We have done that for you. There are additional things you can buy from the teacher's store if you desire or things you can print off the teacher's website for your classes. I have to add, I think our training is incredible. I am biased because I help teach it, but I am not the one that makes it awesome. We have a marketing guru who will give you tips on how to market your business, we help you learn to teach important things AT the training so that your first experience teaching is in a comfortable and supportive environment. You will leave with so many tools that I only WISH I had when I started. Because some of the people on the board of directors are teachers, we have really worked to give you from the beginning things that took us years to develop. One of our new teachers learning to run a class at a recent training. Q: I am worried about the online birth classes. Why would people take my class if they can take an online birth class? I don't want to be competing with my own company. A: I think this is a VERY valid question and is actually one that I had when I first got involved with everything. Having switched to Birth Boot Camp for a while now I have to say that it isn't an issue. Here is what it comes down to- MOST people want a live class. IF they want a live class they will take one if at all possible. There are benefits to live classes like a community of people, access to a teacher you can question, and just the conversations and discussions you learn from in a group setting. SOME people simply CAN NOT take a live class because of scheduling difficulties (or other reasons). 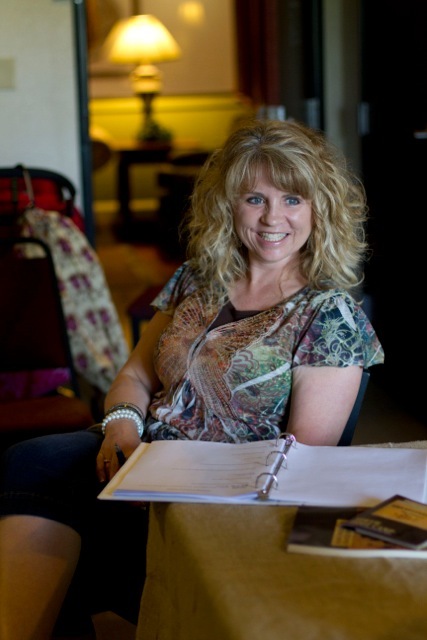 Those are the people that the online birth classes are geared for. It doesn't "steal" your students because they wouldn't have been your students anyway. It turns out that I like having the online classes as a backup in case a student has to miss a class I can arrange for them to do a make-up class that way. I realize now that the online classes are really just a way that we can take good birth education to MORE people than ever before, even people with crazy shifts or who live in places with no teachers. This is about ACCESS and OPTIONS for birthing couples, of which we simply need more of, not less. Q: What is with the name? I don't like the military connotations of "Birth Boot Camp". A: You know, this is honestly one of the first things I thought when Donna told me about Birth Boot Camp and described the names of the course and all the classes. It truly DOESN'T seem very feminine. Then I told my husband about it and I realized how awesome it was. His immediate response was that he "LOVED" the name. The truth is, Birth Boot Camp probably isn't for everybody. BUT- if you want your partner to be really involved in the birth then it IS probably right for you. I think we tend to market birthy stuff to women and women only. 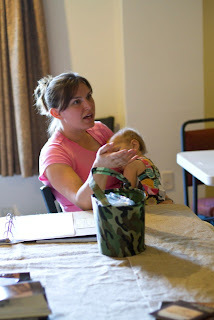 But our mission at Birth Boot Camp is to "train COUPLES in natural birth" NOT just women. We believe that birth can be a family event with mother and father both very deeply involved and satisfied. That is part of our mission and that shows up in the name because we want these classes to appeal to the birth partner too. Another reason why we choose the name is that we DO believe that birth and preparing for birth is hard work and requires dedication and time. The "boot camp" aspect of the name has more to do with being dedicated and serious than beating anybody up. We don't beat people up! I swear! There is no vomiting in class. Having a "theme" also helps organize all the classes and materials in a uniform way that makes sense and is pulled together with a common element. Q: Why is one of the requirements that teachers have had a natural birth? A: You know, I realize that birth is a sensitive subject. This truly isn't meant in a hurtful way. But the truth is that this "requirement" isn't about the teacher, it is about the STUDENT. Before we got going we asked STUDENTS what they were looking for in a class. Overwhelmingly they wanted a teacher who had experience birthing naturally. That is something we seek to provide. Not only that, I personally believe that the birth experience matters. It impacts women. It changes them. This impact is there no matter how the birth goes. I do believe that being able to speak from a place of inner knowing is valuable in a way that book knowledge is not. I personally don't attempt to understand the emotions and journey to VBAC because I haven't DONE IT. I get it, I support it, I think it is truly awesome, but I can't speak from a place of personal knowledge on that subject. And when I can't speak from that place on my blog, I let other women who have that knowledge speak for me. That is why I try to share VBAC stories. I have lost count of the number of doctors and nurses I have taught in my birth classes over the years. All these professionals knew more about some aspects of birth than I did. They had years of education behind them. Some had caught hundreds of babies. I can't compete with that and I won't even try. The place I can speak from is my knowledge about natural birth and my KNOWING what this feels like, how much it matters, and how it can be done. Q: The company is pretty new, how am I going to get students?! A: The company IS new. I am still getting students though! Honestly, it probably will take some time to get yourself out there and for people to know who you are in your community. My students now are referrals from midwives who have seen my students do well and referrals from former students. Being involved in your local birth community is deeply important. It will help you better know what is going on and what you need to specifically address in your classes and it lets people know that you are out there. When I very first started teaching it was mostly people within my sphere of influence who came to class. That is probably how most people start. It does take time. We DO though have some marketing training in our teacher training. We as a board are also working TIRELESSLY on getting the Birth Boot Camp name out there so that you will come up in teacher searches. I am constantly writing and contacting people as are all of our board members. We also attend workshops and events for the birth community. For you, being involved in or starting a local birth network or breastfeeding support group or something in your area will also be a fabulous way to advocate for change as well as letting people know you are out there. Q: What is the basic outline for the trainings themselves? A: Currently we are holding trainings that run Thursday, Friday, and Saturday. You will meet from early in the morning until late in the evening. Times vary a little from day to do but it is a full weekend. During the trainings we cover the curriculum that you will be teaching (you can find it HERE). We will also teach you how to TEACH the materials, go over the videos, cover basic marketing, give you a chance to experience teaching, cover how to teach relaxation and other comfort measures, and you will take your test. A: We really encourage breastfeeding and many of us on the board have years and years and years (yikes!) of breastfeeding experience. If your baby is small enough that they will be content at a lengthy training, then bring them. If they are bigger and more mobile but still need you for nursing and comfort, you may want to have somebody else who can take the baby out and bring them too you as needed. You know your baby best. Contact us if you have more questions. I know this is a big post- I hope it answers your questions if you had them. Thank you so much for reading and congrats if you actually made it through this huge thing. Thanks for this. I am still a bit miffed that the cost of training will be going up so much next year, because I won't be qualified to become an instructor until then! (My firstborn is six months, so I have another six months+ of nursing to go.) Regardless, I'm excited to attend a training sometime next year! Thanks for the info on the affiliate program. I cannot count how many people I've sent to BBCI (I teach another, similar method) because they cannot find a local teacher or don't have time for a full course. Great to know I could make something back for that! I'm considering taking the BBCI training myself. I wish you could offer the training through an online format since I'm in Canada and cannot travel due to my family and work situation. Maybe one day? Thanks in advance! I'm really interested in BBC! I agree. You should start teachingonline.